Of all the injury types that are listed on this website, one of the potentially worst that a person can suffer is a spinal cord injury. This is because this type of injury can be devastating in terms of the lifelong neurological and bodily impairments that can result. The spinal cord, of course, provides nerve sensation throughout the body. These nerves feed muscles throughout the body. When the spinal cord is injured or damaged, it can result in partial or total paralysis. The physical consequences of a spinal cord injury are typically far more debilitating when the damage to the spinal cord occurs at a higher point along the spinal column. This is due to the fact that the spinal column and spinal cord provide nerve sensation and nerve messages to the rest of the body from the "top-down." 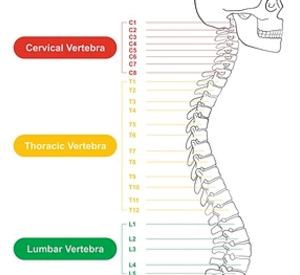 When the spinal cord is injured, it cannot carry or transmit those nerve messages below the level of the injury location on the spinal column. Spinal cord injuries are medically classified as being either "complete" or "incomplete." "Complete" is the worst: It indicates that there is no nerve sensation or function below injury level on the spinal cord. For example, a medical diagnosis of "Complete spinal cord injury, C-3," means that the injury occurred at or near the 3rd cervical vertebra, and that beneath that level (near the neck,) the victim would have no movement or sensation. A diagnosis of "incomplete" at any level means that there is some function below the level of injury. What Typically Causes Spinal Cord Injuries? A spinal cord injury (SCI) occurs when the spinal column ("backbone") experiences a sudden, traumatic impact which causes fracturing, crushing, compression or dislocation of the vertebrae discussed above. The National Spinal Cord Injury Statistical Center reports that there are approximately 255,000 people suffering from SCIs in the United States. Approximately 12,000 additional injuries occur each year - that's about 1,000 new injuries per month. Not only can the medical and physical consequences of a spinal cord injury be devastating, the financial costs can be enormous due to the extensive care and long-term rehabilitation that such disabled patients typically require. This can include disc replacement or neck fusion surgeries, pain management and physical therapy. Spinal cord injuries resulting in partial or total paralysis require long-term medical care and supportive social services. Often, this can last an entire lifetime. The resulting financial as well as emotional stress on the victim's family can be overwhelming. What Does All This Mean When it Comes to Choosing a Law Firm For a Massachusetts Spinal Cord Injury? A lot. It means that if you choose the "wrong" law firm or lawyer to sue the person or party whose negligence caused your spinal cord injury, you will likely be sorry. Either the case will settle for much less money than you may deserve, or, if the case were to go to trial, you may well lose a jury verdict. Spinal cord injury cases are very complicated. They requires years of specialized experience, by trial lawyers that have a proven track record of success. Because of the very high damages that are usually involved in these cases, they are defended by top liability defense lawyers, and they don't give an inch. The trial lawyers with the Boston spinal cord injury law firm of William D. Kickham have extensive experience in handling these serious Massachusetts personal injury cases. We know how to investigate these cases, assemble the right evidence, we have access to the best medical experts, and we know how to get the maximum amount of financial damages for our Massachusetts spinal cord injury clients. Hiring the "right" Boston Massachusetts neck injury attorney can mean everything: Knowing how to investigate, formulate and litigate your case is critical to securing the maximum compensation that you deserve. If this isn't done in the best way possible, your future financial security and well-being can be threatened. How Do I Know Who to Talk to When it Comes to Hiring a Lawyer For My Massachusetts Spinal Injury Case? With all the law firms out there, it can be tough to know who to speak with. When it comes right down to it, the best answer to this question is two-fold: 1) Experience and 2) Results. We have both. If you or someone you care about has suffered a spinal cord injury in Massachusetts, call us today at Ph. : (617) 285-3600, or Ph. : (781) 320-0062; or click here to send us a confidential email. We will provide you with a free consultation to review your accident and your legal rights. Not only is the initial consultation FREE, but if we accept your case, you will owe us NO LEGAL FEES unless we are successful in obtaining financial compensation on your behalf. This fee system is known as the "contingent fee system," and briefly, it means that you will not owe us any professional legal fees unless we win your case and obtain damages on your behalf. When we accept a new client, we immediately begin our investigations to build your case for maximum damages. As your lawyers, we will also interface with a variety of other parties on your behalf: Hospitals, doctors, bill collectors, and your employer if necessary. What Happens When Someone Else's Negligence Causes a Spinal Cord Injury? Frequently (though not always,) spinal cord injuries are caused by another person's negligence. This is most often the case with motor vehicle accidents, slip & fall accidents, construction site accidents and medical negligence are involved. In these cases, a number of potentially liable defendants might exist, which will all depend on the specific facts surrounding the accident. They could include property owners, motor vehicle operators, doctors or medical professionals, equipment manufacturers, employers or more. The answers are very situation-dependent. When these circumstances are present, the person who suffers the injury may have a legitimate Massachusetts personal injury claim. Obtaining maximum financial compensation in these cases is critical, and hence the Boston Massachusetts spine and back injury law firm that you choose must have proven expertise in these cases. This is due to the reality that spinal cord injuries require extensive medical specialty care, and it is all extremely expensive - even for those who have health insurance. If paralysis is involved, long-term personal life care plans need to be formulated and expenses forecasted. Producing these expense forecasts requires close collaboration between your attorney, health care specialists, and family members. Spinal cord injury cases are tough. They often take a considerable amount of time to complete, because of their complexity and because liability defense lawyers fight them tooth and nail due to the very high financial damages involved. Because of these factors, you have to choose your Boston, Massachusetts spinal cord injury law firm carefully. If you feel you have been injured in a Massachusetts spinal cord accident, it is very important that you take immediate steps to protect your rights. Click here to receive our FREE article, "The Top 10 Things To Do After Suffering An Accident Or Injury In Massachusetts." This document contains valuable information about immediate action you can take to protect your legal rights, following an accident or injury caused by another person's negligence in Massachusetts - including spine and back/neck injuries. Many people don't know how to proceed following a spinal or neck injury that is caused by someone else's negligence. But in this FREE article you'll discover how to best protect yourself or your loved one and how to proceed after you've suffered a personal injury that was caused by someone else. The Boston Massachusetts spinal cord and neck injury law firm of William D. Kickham and Associates has extensive experience in litigating Massachusetts neck and back injury cases. We know that you have many questions surrounding your injury, from "Do I have a case?" to "Who will pay for my medical bills?" to "How much money is my case worth?" Call us now at Ph. : (617) 285-3600, or Ph. : (781) 320-0062; or click here to send us a confidential email. We'll answer all of your questions, and you will pay us fees to speak with us. You may recognize Boston, Massachusetts personal injury lawyer William D. Kickham's name from television, newspapers or radio. He has served as a legal analyst and provided expert commentary on several local and national media outlets, including Court TV (now In Session on HLN,) Fox News TV-25/Boston, The Boston Herald, WBZ-AM Radio 1030, WCVB-TV5/Boston, Nightside With Dan Rea, Greater Boston With Emily Rooney, Money Matters Radio/Boston, and The Metro Newspaper/ Boston. If you've suffered a spine, neck or back injury in Massachusetts, put that professional experience and background to work for you. You'll be glad that you did.